You absolutely can get a Glock 26 drop leg holster that carries comfortably and securely. Just because you carry a compact doesn't mean that drop leg carry isn't possible. 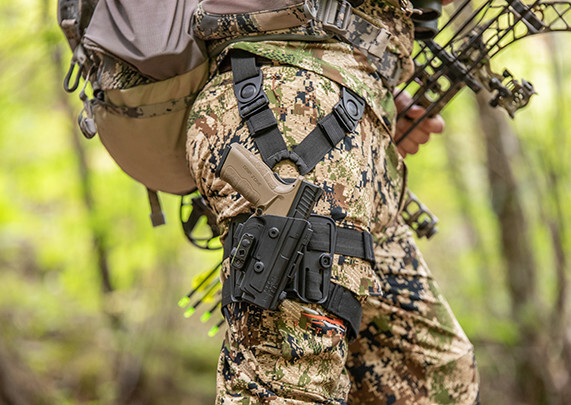 There's no reason to settle for an inferior Glock 26 drop thigh holster either. So many are ""universal"" holsters that don't really fit your G26, requiring you to depend on a sub-par active retention device. If you've ever carried in one, you feel the compromise every time you use it. Why stoop to that if you didn't have to? What if you could get a Glock 26 leg holster that was custom-made for only the Glock 26, offered not only actual retention but adjustable retention, and carried well? Being able to tote a few magazines as well would be a bonus. 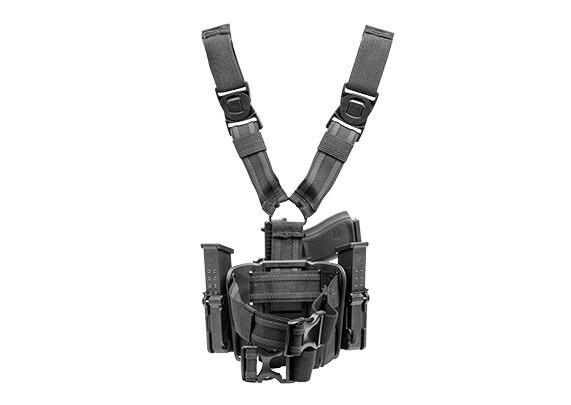 Alien Gear has just such a Glock 26 thigh holster for you. A better thigh carry starts with a better holster. Ours starts with the ShapeShift Glock 26 OWB holster, custom-molded for the 26 so you don't have to live with an anonymous fit anymore. Retention is customizable; dial in the perfect passive retention setting or install the thumb release for active retention as well. 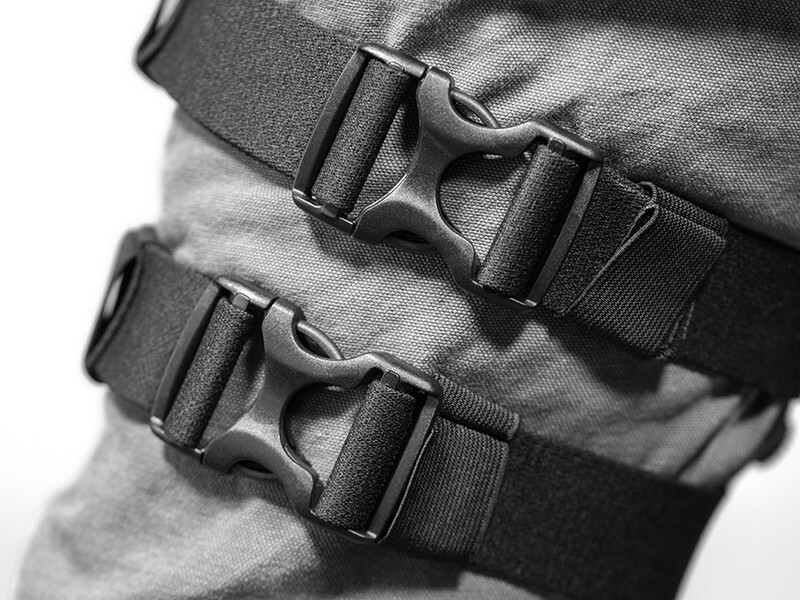 The thigh rig is also compatible with our Cloak Mod paddle holster, though does require a special attachment. The thigh platform itself is injection-molded using our proprietary polymer blend, nearly indestructible under normal conditions. The heavy duty straps ensure a secure hold but also a comfortable carry. The thigh platform also has two additional docking splines for our Cloak Mag Carriers, and can be used with either the single or dual mag carrier configuration. On top of your pistol, you can carry up to four magazines at a time. That will certainly make range days a lot easier. 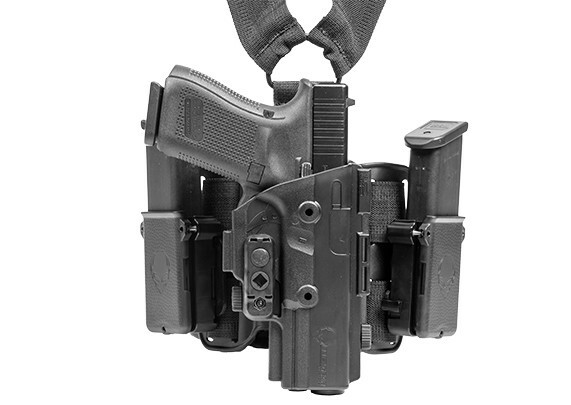 Another benefit of the Alien Gear Glock 26 drop leg holster is that it comes with Alien Gear's Iron-Clad Guarantee, one of the most comprehensive in the industry. That includes the 30-day Test Drive and a comprehensive lifetime warranty, so you can send it back during the first month you have it for a refund if you don't like it and any issue that arises with it will get fixed or you get it replaced. Discover a whole new way to carry.